Follow the instructions below to update you theme. Updating your theme is done via the WordPress Dashboard just like any normal theme. Before you can update, however, you must first authenticate your Elegant Themes subscription using the Elegant Themes Updater Plugin. Once authenticated, you can update your Elegant Themes using the standard update interface in WordPress. To authenticate your WordPress installation, you must first download and install the Elegant Themes Updater. Download the ZIP file here, and then install it via the Plugins > Add New link in your WordPress Dashboard. Click the “Upload” link on the Plugins page to load the plugin installation page. Next, click the “Choose File” button to locate the elegant-themes-updater.zip file that you just downloaded. Select the file, and then click the “Install Now” button to upload the plugin. Once the plugin has been fully uploaded, click the “Activate Plugin” link to activate the plugin. Next, you will need to authenticate your Elegant Themes membership. Only active subscribers have access to theme updates. Once the plugin has been installed, click the Settings > General tab and scroll to the bottom of the page. 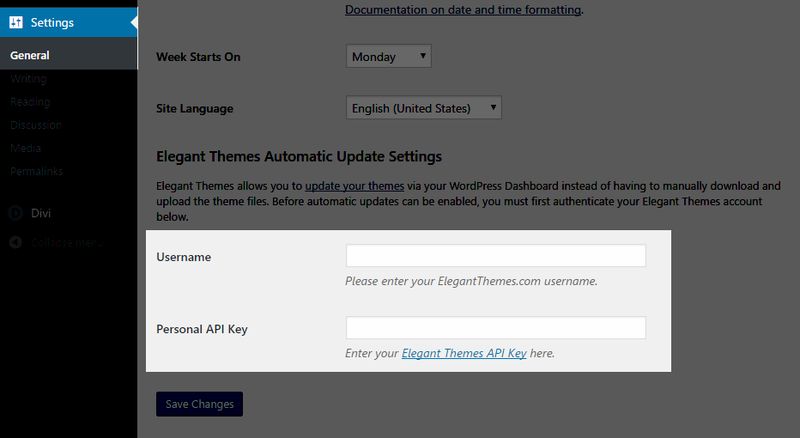 You will notice that a new section has been added called “Elegant Themes Automatic Update Settings.” Here you will need to input your Elegant Themes Username as your Elegant Themes API Key. 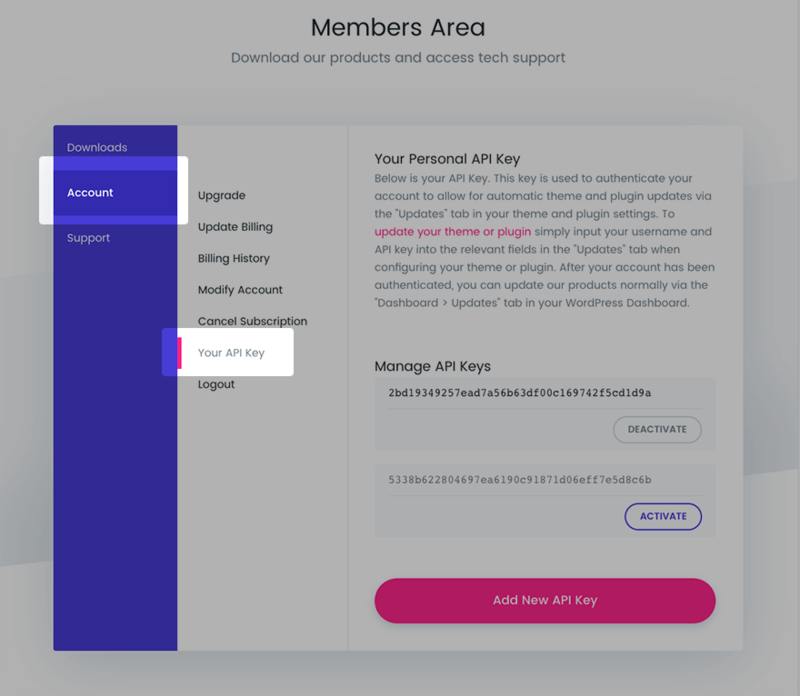 You can find your Elegant Themes API Key here, or by logging into your Elegant Themes account and clicking on the Account > API Key link. Once you have entered your credentials, you are now ready to update your theme. Click on the Dashboard > Updates tab and update your theme normally using the WordPress update interface.